The Ingraham Glacier/Disappointment Cleaver on Rainier is a classic ascent route on one of the most well known and recognized mountains in the world and the best "first step" in learning safe glacier travel skills using a proven curriculum and top notch professional guides and mountaineering instructors. Day 1  Meet at IMG Ashford Headquarters (directions) at 2:00 p.m. for the pre-climb instructional meeting. This meeting of approximately 4 hours is instrumental in getting the team outfitted, informed, packed and educated prior to departure the following morning. Topics to be covered include an introduction of the entire team, an introduction to Mt. Rainier National Park, its mission and ecology; a safety briefing; issue and fitting of gear; personal gear checks and issue of group gear; instruction in the proper use of safety equipment including helmets, harnesses and avalanche beacons; introduction to knots, ropes, rope travel and a review of additional critical climbing skills. 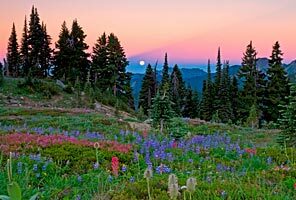 Day 2  Meet at HQ at 8:00am for an early departure to Paradise (5420 ft.) at the end of the road in Mount Rainier National Park. We ascend to Camp Muir at 10,080 ft. through picturesque alpine meadows and snowfields. Plan on a long day; hiking and climbing for roughly 5-6 hours and gaining 4,600 ft. over 4½ miles to Camp Muir. Along the way, the guides/instructors will introduce efficient climbing techniques including pace, rest stepping, breathing, rest break procedures, clothing layering systems, food and water intake requirements and other essential climbing skills. We will spend the night in the guide hut at Camp Muir overlooking the Nisqually and Cowlitz glaciers and the rugged Tatoosh range to the South. Day 3  This day is less physically demanding and helpful for recovery and acclimatization. After a casual breakfast we conduct a complete glacier travel and skills training school on the Cowlitz Glacier adjacent to Camp Muir. The team gathers all gear from Camp Muir and ropes up for the first glacier crossing to put our newly learned skills to practice. A short trek across the Cowlitz Glacier leads to steeper travel up a scree trail through Cathedral Gap. We'll step onto the Ingraham Glacier and climb a short bit further to a broad, flat section of the glacier. A pre-established camp at "The Flats" is waiting for us after our 1½ hour hike. This camp at 11,000 ft offers a stunning view of the precipitous north face of Little Tahoma, the third tallest peak in Washington, and the spectacular Ingraham and Emmons Glaciers. A summit team informational meeting with the guides will take place in the afternoon followed by an early dinner and a short night's sleep. Day 4  Starts with an alpine start, up as early as midnight with a hot drink and instant breakfast. After all teams are roped up we'll make our way up the Ingraham Headwall (early season only, and all snow) or onto the Disappointment Cleaver (always by mid-season, and mostly rock) eventually gaining the upper snow slopes of the mountain. Throughout the day, the guides will be directing their rope teams, providing continuous instruction, safety feedback and hands on training in safe glacier travel. We'll ascend glacier terrain to the very top, finally ending at the summit crater. We spend an hour or more on top (weather permitting) and walk over to the true summit, Columbia Crest, 14, 410'. In descent, we navigate the glaciers back down to the Flats utilizing all of the skills we have learned. After a short rest at the Flats, we'll travel as teams an hour lower down the mountain to Camp Muir for another stop. From there we'll continue on down to Paradise where our van will be waiting to shuttle us back to Ashford. Our 3 day climb and 12-14 hour summit-day culminates with a group debrief and awarding of certificates of achievement by the guides. Just can't even thank you enough for the incredible experience I just had summiting Mt. Rainier with your company... What a remarkable team of guides we had... They were patient, funny, experienced, knowledgeable, and excellent teachers. I always felt safe and had a blast. I will definitely be climbing with you again... Thanks again. You guys are simply the best!